Flip it constantly. Don’t flip it at all. Salt it thoroughly. Don’t salt it until the end...The list of conflicting advice on the internet over how to make the perfect burger goes on. Some use science to back up their claims, while others rely on anecdotal evidence. But when it comes to flavor, there is one thing all sources seem to agree on: buy better beef. That means high-quality grass-fed beef. Grass-fed beef is not only more flavorful, it’s better for you and better for the environment. Paying a little more for better quality, like any ingredient, will make the most dramatic difference in how your food tastes — not the way you cook it. The grass-fed beef I used for these burgers came from Bi-Rite Market, hands down my favorite grocery in the Bay Area. I love it because I know I can trust it, the quality is always excellent and everything is as fresh as it is at the farmer's market. In fact, if I can’t make it to the farmer’s market one week, a quick trip to Bi-Rite will fill me in on what I missed. That's because since its founding nearly 60 years ago, Bi-Rite has built a reputation around its strong, long-standing relationships with farmers and it’s dedication to sourcing the most seasonal ingredients. There, every product has a story and every vendor has been carefully vetted. On a recent visit to Bi-Rite, I was able to meet Simon, the store's main produce buyer, who has been at the company for over a decade. He told me that Bi-Rite's relationships with farmers are the single-most important factor in the store's success. For this burger, I used Bi-Rite’s grass-fed beef, which comes from Richards Grass Fed, a sixth-generation California rancher whose Australian-origin, pastured cattle are raised on a 100 percent grass diet across the lush pastures of Yuba and Modoc counties. The microgreens I used to top this better burger are from New Natives, a local company that has been working with Bi-Rite for the past decade. And the avocados are from Rancho Vazquez, which sends the store a pallet of hass avocados every week so that Bi-Rite can ripen them to perfection for its customers. Okay, back to the better burger. While quality is key for flavor, you still have to cook it correctly to get the right texture. And with burgers, there are a couple of other factors that could all make the difference between a tender burger and a tough one. The first is not overworking the meat when forming the patties. Overworking can make the proteins cross-link each other, making the final burger dense instead of tender. The next trick is to keep the meat really cold until it’s ready to hit the stovetop. If your burgers are warm and pliable, that means the fat is sticking to your hands — not your burger, which is where you want it. As for the bread, make sure you get soft buns. I love using brioche for burgers because it’s almost like it becomes part of the burger. And toasting the buns with a little slick of chipotle makes the burger that much more interesting. This particular burger gets a little heat from the chipotle-toasted buns and then a cooling sensation from the mint aioli. Quick pickled onions add a necessary tang and crunch, while the microgreens give the whole thing a burst of freshness and a bit of green that's not your typical iceberg or romaine. When it comes to cooking the perfect burger, a few things are key: Handle the meat as little as possible. Make the patties ahead, and refrigerate until you’re ready for them to hit a hot pan. For best results, use a cast-iron skillet to cook the patties. 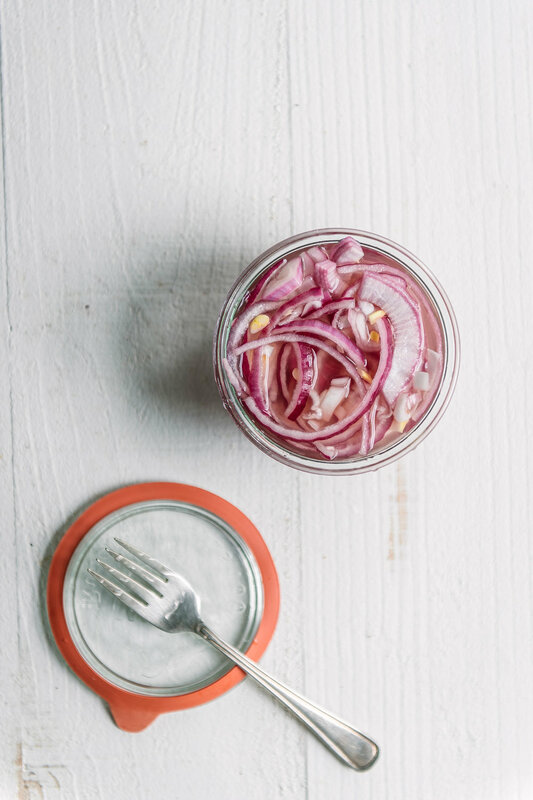 To make the quick pickled onions, whisk together the first three ingredients and 1 cup water in a small bowl until the sugar and salt dissolve. Place the onion in a jar and pour the vinegar mixture over top. Let sit at room temperature for 1 hour. To make the aioli, add all the ingredients into the base of an immersion blender. Blend on high speed until all the ingredients are incorporated and you have a smooth sauce. Alternatively, blend in a food processor. To make the burgers, shape the beef into 6, 1-inch thick patties. Handle the meat as little as possible – the more you work it, the tougher it gets. Using your thumb, make a shallow depression in the center of each burger to prevent them from ballooning up. Place in the fridge to chill. Meanwhile, heat the oven to 350°F. Spread a thin layer of chipotle sauce on each bun and bake until toasted, 4 to 6 minutes. In a large cast-iron skillet over high heat, warm the oil and butter until melted. Add the patties, working in batches if needed, until browned on each side, about 6 minutes for medium-rare. Remove patties from the heat and let cool. Layer brioche buns with aioli, burger patties, a few onions, a sprinkle of feta and a handful of microgreens.